Paul McDonald is simply doing real estate the way it should be done. With more than 26 years in the industry he successfully combines the traditional values of the local property market with a modern approach. Valuing quality service above all else, Paul understands that taking the time to not only get to know each client, but to comprehensively explain every step along the way, guarantees both trust and enduring connections. Co-founder of McDonald Upton Real Estate and with a talent for hiring the right people, Paul believes that possessing the inherent qualities of empathy, energy, and drive, can often count for more than experience. He is a generous mentor whose extensive experience and authentic approach has ensured the career success of many. 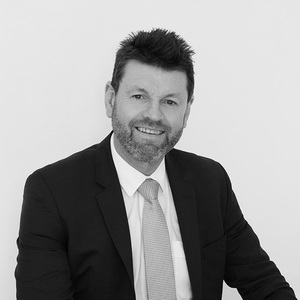 Paul is a highly respected industry leader, with a well established reputation for quietly effective negotiation and an undiminished enthusiasm for the area. Armed with considerable local knowledge and with personal ties to the Essendon Football Club, Doutta Stars Cricket Club and the Essendon Food and Wine Society, Paul is a committed member of the community. 100% hands on and committed to the business, Paul is nevertheless aware of the importance of downtime to re-energise. When not enjoying time walking his two much loved dogs, Buster and Boony, Paul, merely adding to his arsenal of sporting prowesses, tackles the fairways with accomplishment. Paul was lovely to deal with from the first meeting till the day of auction. His calm and informative manner was professional and appreciated. Tony was a pleasure to deal with from our first meeting till the successful auction day. His positive and professional attitude throughout the campaign was greatly appreciated. Dealing with Paul, Simone and the McDonald Upton Team was such a great experience. What can be an overwhelming time selling your home was made easy and stress-free. There organised approach and Paul's upfront and honest nature made us feel comfortable we had chosen the right agent. We got a great result and we were really pleased with the outcome and the advice and market knowledge Paul was able to provide. Can not recommend Paul and the team enough!!! Paul delivered a sale outcome near the top of the range with a minimum of fuss. He had the courage to change marketing tact mid-campaign and kept a sense of conviction throughout. A sensible operator who considers all factors in planning and adapts on the go. Recommended. We decided to use Paul McDonald Real Estate to sell our home in Prefect Street in May 2016. We had bought the home from Paul in 1994, rebuilt it from scratch in 2000 and it served us faithfully for 22 years. Initially we were very worried about selling as we had many small jobs to do around the house and were very worried about getting tradesmen. We spoke to Paul and he said “But that’s what we do!” Well, we had no idea that this could all be arranged and overseen by the agent and could be completed in 2 weeks ……. geez! The lovely Caroline turned up to manage the works, organise to “show” the house and make sure everything went smoothly. Carpet, painting, tile work, plumbing, electrical and cabinet repair. But hang on……the pricing seemed incredibly low and certainly less than we could have arranged in such a tight timeframe. Suddenly the house was on the market glowing in its new paint, new carpet and new matching furniture. Liz did all the back-room detail, Julia was organising inspections, Paul gave us instant feedback on each inspection. Then the big day arrived! We were a bit concerned about Paul’s new beard but there he was out the front extolling the virtues of our lovely home. The price reached was what we were after, more importantly it was purchased by a lovely couple with a young family who we were convinced would look after the house for years to come. What a professional experience, we never thought a real estate agent would offer all those extra services and make what is a nervy experience seem so simple. We would highly recommend Paul and his incredible team to anyone, but particularly people who need that extra service to list their home…. and maybe, in time, Paul might even trim that beard! Thank you for all your help and guidance in the successful sale of our home in Essendon. Your advice and knowledge is the best in the business! A note to thank you all for your efficient handling of the recent sale of our property in Thomson Street. We greatly appreciated your sensitive approach, straightforward advice, regular feedback and personalised service during the period of our sale. After a five week campaign, our home sold on auction day for a price that we had hoped for and which you advised was realistic. Your competency has convinced us that we were right to select your company and that Boutique is indeed Better. We have already recommended you to friends who are considering selling in the not too distant future and will readily suggest your company to others. Many thanks, may your success continue.